A method of enhancing a fabric article includes drying the fabric article in a fabric article drying appliance and applying a benefit composition as a spray to the fabric article in the fabric article drying appliance. The benefit composition includes an agent for enhancing the whiteness and/or brightness of the fabric article. This application claims the benefit of U.S. Provisional Application Ser. No. 60/568,771 entitled “Uniform Delivery of Compositions”, filed on May 6, 2004 and is a continuation-in-part of U.S. Ser. No. 10/842,926 entitled “Fabric Article Treating System and Method”, filed on May 11, 2004; which is a continuation-in-part of U.S. Ser. No. 10/839,549 entitled “Processes and Apparatuses for Applying a Benefit Composition to One or More Fabric Articles During a Fabric Enhancement Operation”, filed on May 5, 2004; which is a continuation-in-part of U.S. Ser. No. 10/762,152, entitled “Volatile Material Delivery Method”, filed on Jan. 21, 2004; which is a continuation-in-part of U.S. Ser. No. 10/697,736, entitled “Fabric Article Treating Method and Device Comprising a Heating Means”, filed on Oct. 29, 2003; U.S. Ser. No. 10/697,734, entitled “Thermal Protection of Fabric Article Treating Device”, filed on Oct. 29, 2003; U.S. Ser. No. 10/697,685, entitled “Fabric Article Treating Device Comprising More Than One Housing”, filed on Oct. 29, 2003; and U.S. Ser. No. 10/697,735, entitled “Fabric Article Treating Apparatus with Safety Device and Controller”, filed Oct. 29, 2003; each of which is a continuation-in-part of U.S. Ser. No. 10/418,595, entitled “Fabric Article Treating Method and Apparatus”, filed on Apr. 17, 2003, which claims the benefit of U.S. Provisional Application Ser. No. 60/374,601, filed Apr. 22, 2002 and U.S. Provisional Application Ser. No. 60/426,438, filed Nov. 14, 2002. The present invention relates to method of enhancing a fabric article, and more specifically to a unique method of applying a benefit composition to a fabric article in a fabric article drying appliance for providing whiteness and/or brightness enhancement, for example, whitening and brightening benefits, to a fabric article. Fabric article treating methods and/or apparatuses have been evolving over the past twenty years. For example, U.S. Pat. No. 4,207,683 describes a conventional automatic clothes dryer that incorporates a spray dispenser capable of dispensing liquids into the drum of the dryer. U.S. Pat. Nos. 4,642,908, 5,771,604 and 6,067,723 describe other variations of conventional clothes drying appliances. There exists an ongoing need to develop a fabric article treating method and/or apparatus, especially an in-home fabric article treating method and/or apparatus, that improves/enhances the deposition of fabric article actives or benefit agents on the fabric articles being treated as compared to the currently existing deposition methods and/or apparatuses. Most fabric articles tend to lose their brightness and/or whiteness over time and in addition can incur discoloring or staining. This discoloring, including the yellowing of white fabric articles, can eventually lead to “dingy” looking fabric articles. To alleviate these problems, wash and rinse products have been developed with blue to violet dyes and brighteners. However, since these compositions are usually applied during a wash/rinse cycle in a fabric article washing machine, compositions with high fabric substantivity are typically required due to the washing environment. As a result, dye or brightener build-up can occur on the fabric article leading to undesired effects, for example in fabric appearance and feel. The build-up of dyes and brighteners can require harsh chemicals for their removal, causing fabric damage. Also, greater concentrations of actives are typically required through the wash to produce benefits due to poor deposition efficiencies. Accordingly, further improvements in fabric article treating methods are desired. The present invention is directed methods of enhancing fabric articles. More particularly, the invention is directed to methods of enhancing fabric articles in a fabric article drying appliance by applying a benefit composition having whiteness and/or brightness enhancement agents to the fabric article in the fabric article drying appliance. Dyes and brighteners with limited wet-fastness can be applied in minute amounts to garments in the dryer, producing one-cycle benefits while allowing the agents to be readily washed off in subsequent wash cycles. One embodiment of the present invention is a method of enhancing a fabric article. The method comprises: drying the fabric article in a fabric article drying appliance; and applying a benefit composition as a spray to the fabric article in the fabric article drying appliance, wherein the benefit composition comprises an agent for enhancing the whiteness and/or brightness of the fabric article. The present methods are advantageous for providing whitening and/or brightening of fabric article in a fabric article drying appliance. FIG. 8 is a schematic illustration of an exemplary fabric article treating device suitable for use in a method according to a eighth embodiment of the present invention. The embodiments set forth in the drawings are illustrative in nature and not intended to be limiting of the invention defined by the claims. Moreover, individual features of the drawings and the invention will be more fully apparent and understood in view of the detailed description. Reference will now be made in detail to various embodiments of the invention, examples of which are illustrated in the accompanying drawings, wherein like numerals indicate similar elements throughout the views. The phrase “fabric article treating system” as used herein means a fabric article drying appliance, a non-limiting example of which includes a conventional clothes dryer and/or modifications thereof. The fabric article treating system also includes a fabric article treating apparatus which may be discrete in relation to the fabric article drying appliance and/or it may be integrated into the fabric article drying appliance. Furthermore, the fabric article treating apparatus may be integrated into a readily replaceable portion of the fabric article drying appliance, a non-limiting example of which includes a closure structure of the drying appliance. “Fabric article” or “fabric” as used herein means any article that is customarily cleaned in a conventional laundry process or in a dry cleaning process. The term encompasses articles of fabric including, but not limited to, clothing, linen, drapery, clothing accessories, leather, floor coverings, sheets, towels, rags, canvas, polymer structures, and the like. The term also encompasses other items made in whole or in part of fabric material, such as tote bags, furniture covers, tarpons, shoes, and the like. 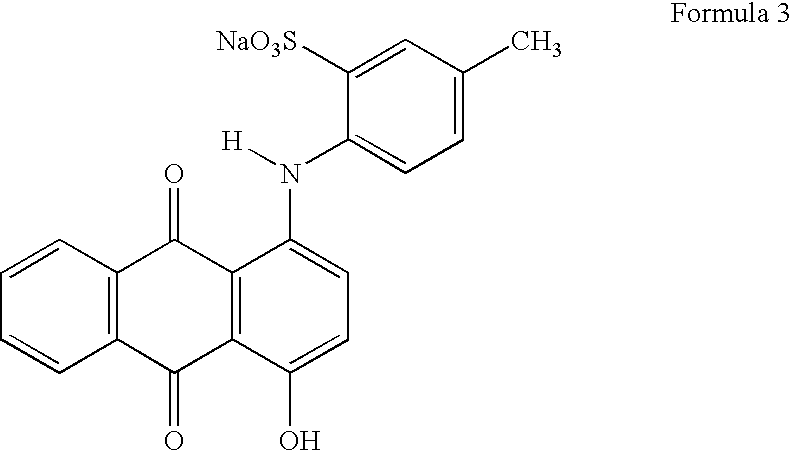 wherein R1 is selected from anilino, N-2-bis-hydroxyethyl and NH-2-hydroxyethyl; R2 is selected from N-2-bis-hydroxyethyl, N-2-hydroxyethyl-N-methylamino, morphilino, chloro and amino; and M is a salt-forming cation such as sodium or potassium. When in the above formula, R1 is anilino, R2 is N-2-bis-hydroxyethyl and M is a cation such as sodium, the brightener is 4,4′-bis[(4-anilino-6-(N-2-bis-hydroxyethyl)-s-triazine-2-yl)amino]-2,2′-stilbenedisulfonic acid disodium salt. This particular brightener species is commercially marketed under the tradename Tinopal-UNPA-GX® by Ciba-Geigy Corporation. When in the above formula, R1 is anilino, R2 is N-2-hydroxyethyl-N-2-methylamino and M is a cation such as sodium, the brightener is 4,4′-bis[(4-anilino-6-(N-2-bis-hydroxyethyl-N-methylamino)-s-triazine-2-yl)amino]-2,2′-stilbenedisulfonic acid disodium salt. This particular brightener species is commercially marketed under the tradename Tinopal 5BM-GX®) by Ciba-Geigy Corporation. When in the above formula, R1 is anilino, R2 is morphilino and M is a cation such as sodium, the brightener is 4,4′-bis[(4-anilino-6-morphilino-s-triazine-2-yl)amino]2,2′-stilbenedisulfonic acid sodium salt. This particular brightener species is commercially marketed under the tradename Tinopal AMS-GX® by Ciba-Geigy Corporation. 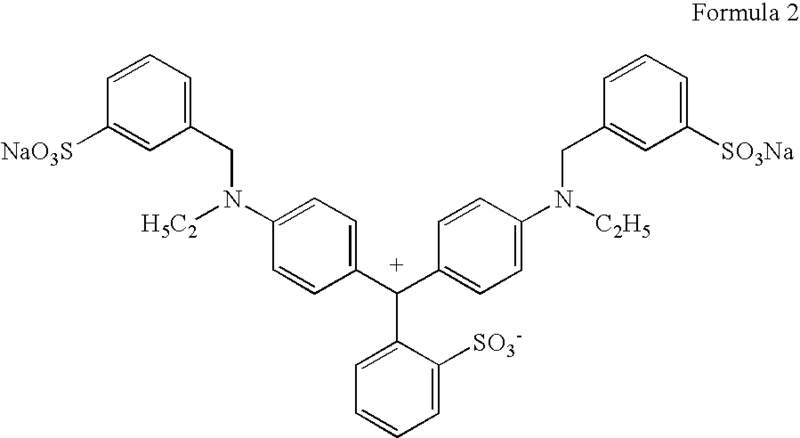 Polymerized dyes are also applicable. Other whiteness and/or brightness enhancement agents which can alter the perceived wavelength of fabric article are generally known to one skilled in the art and are suitable for use herein. In one exemplary embodiment, the whiteness and/or brightness enhancement agent comprises one or more conjugated bonds to enhance fabric substantivity. In another exemplary embodiment of the present invention, the enhancement agent comprises a dye or combination of dyes having a reflecting wavelength of from about 350 nm to about 550 nm. Alternatively, the whiteness and/or brightness enhancement agent comprises a dye having a maximum reflecting wavelength of from about 420 nm to about 500 nm. Alternatively, the whiteness and/or brightness enhancement agent comprises a dye having a maximum reflecting wavelength of from about 430 mn to about 480 nm. In another embodiment of the present invention, the whiteness and/or brightness enhancement agent of the benefit composition is in a microencapsulated form. In another exemplary embodiment, the benefit composition comprises from about 1×10−8 weight percent to about 0.5 weight percent color enhancement agent(s), alternatively from about 5×10−7 weight percent to about 5×10−3 weight percent. As used herein, the term “benefit composition” refers to a composition used to deliver a benefit to a fabric article. Non-limiting examples of materials and mixtures thereof which can also be included in the benefit composition, in addition to the whiteness and/or brightness enhancement agent, include one or more of water, fabric softeners, superwetting agents, water absorbing agents, humectants, anti-static agents, perfumes, reflectance agents, bleaches, lubricants, anti-abrasion agents, wrinkle mitigating agents, preservatives, buffering agents, pH adjusting agents, emulsion stabilizing agents, malodor control agents, silicones, oil dispersing solvents, anti-foaming agents, salt, viscosity adjusting agents, chelating agents, anti-oxidant, radical scavenging agents, soil releasing agents, anti-soiling agents, anti-bacterial agents, solvents, perfumes, crispening agents, water/stain repellants, refreshing agents, anti-microbial agents, durable press additives and combinations thereof. The benefit composition may comprise a liquid, a powder, a luminescent dye, a pigment, a colloidal suspension, or gaseous product, and/or a combination of such. In one embodiment, the benefit composition includes a preservative. Various preservatives which help maintain one or more properties of the benefit composition are generally known in the art and are suitable for use herein. Exemplary preservatives include Dantoguard Plus™ (Dimethylol-5,5-Dimethylhydantoin) commercially available from Lonza (Fairfield, N.J., USA); Kathon™ (isothiazolinones) commercially available from Rohm & Haas; and Integra 44™ (Sodium hydroxymethylglycinate) commercially available from International Specialty Products (ISP). In one embodiment of the present invention, the benefit composition comprises a liquid or gel. In one exemplary embodiment of the present invention, the benefit composition comprises solvent-soluble electricity conducting compounds and/or compositions. Non-limiting examples of materials and mixtures thereof include: polyanilines, polypyrroles, polyacetylene, polyphenylene and polythiophenes. In one exemplary embodiment, the benefit composition comprises a whiteness and/or brightness enhancement agent having a water solution spectrum of λ-max of about 500 to about 670 nm., alternatively having a λ-max of about 550 nm to about 630 nm. (ASTM Method D5386). These exemplary agents reflect at about 400 nm to about 500 nm in the visible spectrum when deposited on desized CW-120 (100% cotton test fabric). In one embodiment, the exemplary agents will absorb yellow wavelengths, about 560 nm to about 605 nm, and with a brightener in the composition, reflection occurs in the shorter wavelengths of the visible spectrum. In another exemplary embodiment, the benefit composition provides a Whiteness Index measurement increase of 1.0 and/or a Yellowness Index decrease of 1.0 when a solution of greater than 0.0005 ppm active is sprayed on white cotton fabric according to ASTM Method E 313. To determine dye wash-fastness and choose relevant dyes, tests were conducted using ΔE measurements, calculating the percent removed after a wash cycle using AATCC Evaluation Procedure 7, equivalent to ISO 105-AO5. In yet another exemplary embodiment, the benefit composition is adapted to have a Whiteness Index reversion (ΔE conversion) of at least ten (10) percent when the fabric article is washed subsequent to the benefit composition being applied in the fabric article drying appliance. One embodiment of the present invention is an exemplary method of enhancing a fabric article. The method comprises: drying the fabric article in a fabric article drying appliance; and applying a benefit composition as a spray to the fabric article in the fabric article drying appliance, wherein the benefit composition comprises an agent for enhancing the whiteness and/or brightness of the fabric article. In one exemplary embodiment, the whiteness and/or brightness enhancement agent comprises one or more brighteners or dyes, or a mixture thereof. In one embodiment, the benefit composition is applied to the fabric article in an amount sufficient to provide whiteness and/or brightness enhancement. In another embodiment of the present invention, from about 0.1 ml to about 2,000 ml of the benefit composition is applied to the fabric article in the fabric article drying appliance. Alternatively, from about 1 ml to about 1,000 ml of the benefit composition may be applied to the fabric article in the fabric article drying appliance. Alternatively, from about 10 ml to about 200 ml of the benefit composition is applied to the fabric article in the fabric article drying appliance. The benefit composition is applied as a spray. In one aspect of the present invention, the spray of the benefit composition has a liquid droplet size of from about 10 μm to about 100 mm. Alternatively, the spray of the benefit composition has a liquid droplet size of from about 100 μm to about 1 mm. Alternatively, the spray of the benefit composition has a liquid droplet size of from about 200 μm to about 700 μm. In further embodiments, the spray may comprise solid particles or a gaseous form. In another exemplary embodiment of the present invention, the method further comprises drying the fabric article without the addition of heat. In an alternative embodiment of the present invention, the fabric article is dried with air heated to a temperature of from about 50° F. to about 300° F. Alternatively, the fabric article is dried with air heated to a temperature of from about 70° C. to about 200° F. Alternatively, the fabric article is dried with air heated at a temperature of from about 100° F. to about 180° F.
In yet another exemplary embodiment of the present invention, the fabric article is dried in the fabric article drying appliance for a period of time from about 1 second to about 10 hours. Alternatively, the fabric article is dried for a period of time from about 1 minute to about 1 hour. Alternative, the fabric article is dried for a period of time from about 5 minutes to about 45 minutes. In another embodiment of the present invention, the amount of fabric articles dried in the fabric article drying appliance ranges from about 0.1 lb to about 20 lbs. Alternatively, the amount of fabric articles dried is from about 1 lb to about 10 lbs. Alternatively, the amount of fabric articles dried is from about 2 lbs to about 8 lbs. It will be understood that the present invention can be readily used in other types of fabric “treating” devices, and is not limited solely to clothes “dryers”. In the context of this patent document, the terms “dryer” or “drying apparatus” or “fabric article drying appliance” include devices that may or may not perform a true drying function, but may involve treating fabric without attempting to literally dry the fabric itself. As noted above, the terms “dryer” or “drying apparatus” or “fabric article drying appliance” may include a “dry cleaning” process or apparatus, which may or may not literally involve a step of drying. The term “fabric article drying appliance” as used herein, also refers to any fabric treating device that utilizes moving air directed upon one or more fabric articles, a non-limiting example of which includes a clothes dryer, and modifications thereof. Such devices include both domestic and commercial drying units used in dwellings, laundromats, hotels, and/or industrial settings. In addition, it should be noted that some drying appliances include a drying chamber (or “drum”) that does not literally move or rotate while the drying appliance is operating in the drying cycle. Some such dryers use moving air that passes through the drying chamber, and the chamber does not move while the drying cycle occurs. Such an example dryer has a door or other type of access cover that allows a person to insert the clothing to be dried into the chamber. In many cases, the person hangs the clothes on some type of upper rod within the drying chamber. Once that has been done, the door (or access cover) is closed, and the dryer can begin its drying function. Dispensing of a benefit composition can take place within such a unit, however, care should be taken to ensure that the benefit composition becomes well dispersed within the drying chamber, so that certain fabric items do not receive a very large concentration of the benefit composition while other fabric items receive very little of the benefit composition. Suitable delivery systems for applying the benefit composition as a spray to a fabric article in the fabric article drying appliance include, but are not limited to, fabric article treating devices and systems that spray or otherwise release a benefit composition into a receiving volume of the fabric article drying appliance. These fabric article devices and systems would typically comprise: an internal dispenser and a reservoir adapted for containing the benefit composition. Reference will now be made in detail to suitable exemplary embodiments of fabric article treatment devices and systems for delivering a benefit composition comprising an agent for enhancing the whiteness and/or brightness of a fabric article. FIG. 1 illustrates an exemplary fabric article treating device 20 according to one embodiment of the present invention. The fabric article treating device 20 comprises an interior dispenser 25 adapted for location inside of a fabric article drying appliance and a reservoir 30. The interior dispenser 25 and the reservoir 30 are adapted for fluid communication with one another, for example via fluid line 32. In one embodiment, the fluid connection between the interior dispenser 25 and the reservoir 30 comprises tubing configured to allow the benefit composition to be transported from the reservoir 30 to the interior dispenser 25. One exemplary tubing comprises a polymeric tubing with one or more channels or conduits. In one embodiment, the tubing is configured to allow the closure structure on the fabric article drying appliance to maintain a closed position while still permitting dispensing of the benefit composition. The reservoir 30 is adapted to contain a benefit composition. In one exemplary embodiment, the reservoir 30 is removable. In another exemplary embodiment, the reservoir 30 comprises a sealed pouch. The reservoir 30 may be constructed of any material known in the art and at least a portion of the reservoir is formed of a material comprising an anti-microbial agent. Non-limiting examples of such materials include polymeric materials including but not limited to polypropylene, polyethylene, styrenics, polyesters, polyethylene terephthalate (PET), polycarbonates, PMMA, polyvinyls, Nylon, polyurethane, acrylic, epoxies, acetates, acrylonitrile-butadiene-styrene, fluoropolymers, latex, nitrile copolymers, nylons, polychloroprene, polyvinylchloride, Rayon, rubbers (natural and synthetic), silicone, and combinations thereof. Other exemplary materials of construction include a metal, for example aluminum foil. In one embodiment, the reservoir 30 comprises multiple layers of one or more materials. In another embodiment, the reservoir 30 comprises a single or multiple layer barrier film. In one exemplary embodiment of the present invention, the reservoir 30 is adapted for location on an interior portion of the fabric article drying appliance 20. For example, the reservoir may be located in the chamber of the fabric article drying appliance. Alternatively, the reservoir may be located within the fabric article drying appliance, but not within the chamber of the fabric article drying appliance. Further, the reservoir may be adapted for location on an exterior portion of the fabric article drying appliance. The interior dispenser 25 may comprise at least one nozzle for the purpose of distributing the benefit composition into the fabric article drying appliance. Misting/atomizing of the benefit composition can be achieved using any suitable spraying device such as a hydraulic nozzle, sonic nebulizer, pressure swirl atomizers, high pressure fog nozzle or the like to deliver target particle size. Non-limiting examples of suitable nozzles include nozzles commercially available from Spray Systems, Inc. of Pomona, Calif. under the Model Nos. 850, 1050, 1250, 1450 and 1650. Another suitable example of a nozzle is a pressure swirl atomizing nozzle made by Seaquist Perfect Dispensing of Cary, Ill. under Model No. DU-3813. In another exemplary embodiment, as illustrated in FIG. 2, the fabric article treating device 20 further comprises fitment 44, which is one of corresponding male and female fitments, and the reservoir 30, shown as a sealed pouch or carton, comprises the other fitment 42 of the corresponding male and female fitments, wherein the female fitment is configured to receive the male fitment to establish the fluid communication between the interior dispenser 25 and the reservoir 30. In the embodiment of FIG. 2, the fitment 42 on the reservoir 30 is the female fitment, while the corresponding male fitment 44 is adapted for fluid connection with the dispenser 25, for example via a fluid handling system as described hereafter. Various corresponding male and female fitments which establish fluid communication are generally known in the art and are suitable for use herein. One exemplary fitment that may be utilized is available from IPN USA Corp. of Peachtree City, Ga., available as Clean-Clic® pouch fitments, model number SBS4. As one skilled in the art will appreciate, any fitment system can be utilized in the present invention provided the fitments are configured to maintain fluid communication between the reservoir 30 and the interior dispenser 25. In one exemplary embodiment, as illustrated in FIG. 3, the fabric article treating device 20 further comprises a fluid handling system 55, a power source 50 and a controller 60. In one exemplary embodiment, the fluid handling system 55 is configured to transport the benefit composition from the reservoir 30 to the interior dispenser 25. The interior dispenser 25 is configured to deliver the benefit composition to one or more fabric articles in the fabric article drying appliance. The power source 50 is configured to provide electrical power as needed by the fluid article treating device, such as the controller 60, the fluid handling system 55, sensors, and any electrical needs of a user interface. The controller 60 is configured to regulate the dispensing of the benefit composition. For example, the controller 60 may determine the optimum time to dispense the benefit composition, the quantity of benefit composition to be dispensed and the rate at which to dispense the benefit composition. In one embodiment, the fabric article treating device further comprises a communication link adapted to provide communication between the controller of the fabric article treating device and the fabric article drying appliance. For example, the controller may send and/or receive signals to/from the fabric article drying appliance to determine the optimum benefit composition dispensing conditions such as, time, length, etc. Another exemplary embodiment of the present invention is illustrated in FIG. 4. In this exemplary embodiment, the fabric article treating device 20 further comprises a housing 65. The housing 65 is adapted to receive various components of the fabric article treating device, optionally, the housing may substantially enclose and protect the components in their assembled form. For example, as shown in FIG. 4, the housing may receive the power source 50, the fluid handling system 55, the controller 60 and the reservoir 30. In another embodiment, the housing may comprise a tubing storage area adapted to contain a quantity of fluid line 32 to allow the user to customize the installation of the fabric article treating device for the user's particular fabric article drying appliance. The housing 65 may be constructed with any materials known to one skilled in the art. Exemplary materials include, but are not limited to, polymers, plastics, ceramics, metals, fabric, wood, and the like. The housing 65 may be located on the exterior or interior of the fabric article drying appliance. In one exemplary embodiment as illustrated in FIG. 5, the fluid handling system 55 comprises a pump 70. The pump 70 is in communication with the reservoir 30 and the interior dispenser 25 via fluid lines 72 and 74, respectively. The pump 70 is configured to transport benefit composition from the reservoir 30 to the interior dispenser 25 for dispensing of the benefit composition. In one embodiment, the pump 70, comprises a piezo-electric pump. In another embodiment, the pump 70 may comprise a diaphragm pump. As one skilled in the art will appreciate any pump known to one skilled in the art may be utilized to transport the benefit composition from the exterior reservoir 30 to the interior dispenser 25. Other exemplary pumps include piston pumps, peristaltic pumps, and bellows-type pumps. As noted above, one type of pump 70 that can be used in the present invention is a piezo-electric pump. While a piezo-electric pump has certain membranes or laminations which may vibrate in a reciprocating-type fashion, the piezoelectric pumps generally do not have major moving parts, such as rotating shaft and bearings used with a rotator member to displace a fluid or gaseous fluid, that experience wear over time. One commercially available suitable piezo-electric pump usable in the present invention is manufactured by PAR Technologies, LLC, located in Hampton, Va., and marketed as the “LPD-Series” laminated piezo-electric fluid pumps. Pumps which draw a relevantly low current are particularly suitable in certain embodiments. In another embodiment, the reservoir 30 may be positioned in such a way to provide gravitation flow of the benefit composition to the interior dispenser 25. For example, the reservoir 30 may be mounted above the fabric article drying appliance to create static head on the benefit composition to allow dispensing of the benefit composition without the utilization of a pump. Another exemplary embodiment of the present invention is illustrated in FIG. 6. In this embodiment, as in previously discussed embodiments, the fabric article treating device 20 comprises an interior dispenser 25 adapted for location inside of a fabric article drying appliance and a reservoir 30 adapted to contain a benefit composition. The interior dispenser 25 and the reservoir 30 are adapted for fluid communication with one another. The device further comprises a controller 60 in electrical communication with a sensor 75. In one exemplary embodiment, the sensor comprises a temperature sensor. In another exemplary embodiment, the sensor 75 comprises a light sensor. In yet another exemplary embodiment, the sensor 75 comprises a motion sensor. The controller 60 is adapted to send and/or receive signals from the sensor 75 and to determine the dispensing conditions for dispensing the benefit composition. Another embodiment of the present invention, as illustrated in FIG. 7, is a fabric article treating system 80. The fabric article treating system 80 comprises a fabric article drying appliance 35 having a chamber 81 and a closure structure 85, for example, a door. The closure structure 85 has a closed position and at least one open position. The closure structure 85 allows access to the chamber 81 of the fabric article drying appliance 35. The fabric article treating system 80 further comprises a reservoir 30 for containing a benefit composition; a dispenser 25 in communication with the chamber 81; and a fluid handling system 55 that compels the benefit composition from the reservoir 30 toward the dispenser 25, thereby dispensing the benefit composition into the chamber 81. As discussed above, the reservoir 30 may be removable. In another embodiment, the reservoir 30 comprises a sealed pouch. Another embodiment of the present invention, as illustrated in FIG. 8, is a fabric article treating system 80. The fabric article treating system 80 comprises a fabric article drying appliance 35 having a chamber 81 and a closure structure 85. The closure structure 85 has a closed position and at least one open position, wherein the closure structure 85 allows access to the chamber 81. The fabric article treating system 80 further comprises a reservoir 30 for containing a benefit composition and a dispenser 25 in communication with the chamber 81; a fluid handling system 55 that compels the benefit composition from the reservoir 30 toward the dispenser 25, thereby dispensing the benefit composition into the chamber 81; a closure structure sensor 88; and a controller 60 that initiates dispensing of the benefit composition. The controller 60 is configured to prevent the benefit composition from being dispensed when the closure structure sensor 88 indicates that the closure structure 85 is not in the closed position. In another embodiment, the fabric article treating system 80 further comprises one or more additional sensors 75 in the chamber in communication with the controller. The reservoir 30 may be mounted on the exterior portion of the fabric article drying appliance 35, such as on the fabric article drying appliance closure structure 85, or a side wall, a top wall, an outer surface of a top-opening lid, or the like, including a stand, wall or other household structure that is separate from the fabric article drying appliance. Moreover, the reservoir 30 may be mounted on any interior portion of the fabric article drying appliance 35, examples of which include, but are not limited to, the interior surface of the closure structure 85, the drum of the fabric article drying appliance, the back wall, the inner surface of a top opening lid, or the like. Optionally, filters and/or filtering techniques can be used to filter the benefit composition, if desired, for example at a point between the reservoir 30 and the outlet of the dispenser 25. Non-limiting examples of this include: utilizing a filter in the interior dispenser 25 prior to dispensing of the benefit compositions. Alternatively, the benefit composition may be filtered prior to dispensing into the reservoir; or a combination of filtering techniques may be employed. The interior dispenser 25 and the reservoir 30 are adapted for fluid communication with one another. In one embodiment, the interior dispenser 25 and the reservoir 30 may be in electrical connection with one another. Non-limiting examples of means for connecting the interior dispenser 25 and the reservoir 30 may include utilizing a flat cable (also referred to as a ribbon cable), a wire, a wire or group of wires enclosed in a stealth of woven or nonwoven material, a conduit (a non-limiting example of which is a conduit for the benefit composition), or combination thereof. The woven or nonwoven sheet may be used as a method of attaching the interior dispenser 25 and the reservoir 30. The interior dispenser 25 and the reservoir 30 may be used to provide a means of gravitational counterbalancing so as to reduce unnecessary tension on the wires and/or the connections. The power source 50 may comprise chemical batteries, or any electrical power source, including standard household line voltage, or even solar power. Batteries may be utilized, and are particularly suitable when the fabric article treating device 20 is in the form of an add-on device for an existing fabric article drying appliance 35. However, any appropriate power adapter can be provided to convert an AC power source to the appropriate DC voltages used in any electrical components of the fabric article treating device 20, such as in the fluid handling system 55, the controller 60, and any sensors 75. The power source 50 may also comprise any mechanical power source used to store potential energy, such as springs, weights or compressed gases. As noted, the fabric article treating device 20 can include optional sensors 75. Non-limiting examples of optional sensors include a door (or lid sensor), a motion sensor, a static sensor, a humidity sensor, and/or a temperature sensor. One non-limiting example of a door/lid sensor is an optoelectronic device, such as an optocoupler or an optical input sensor, e.g., a phototransistor or photodiode. When the door/lid of the drying appliance is open, the door sensor will change state, and will output a different voltage or current level along an electrical conductor that leads from the door sensor back to the controller. This can be used as a safety device to immediately interrupt the dispensing of the benefit composition from the interior dispenser 25. The optional door sensor could be utilized even when a control system is integrated into the overall conventional control system of the drying appliance. For example, a drying appliance typically has its own door sensor which shuts off the rotating drum of the dryer when the door becomes open. In this instant, the optional door sensor can act as a backup or second door sensor to the dryer's internal original sensor that shuts off the rotating drum. One example which could be used as a door/lid sensor is an NPN Phototransistor, Part No. PNA1801L, manufactured by Panasonic, of Osaka, Japan. In another embodiment, a communication link could be established between the drying appliance and the controller, wherein the drying appliance would send the controller a signal relating to the operational state of the drying appliance (e.g., door open/closed, drying cycle, temperature, etc.). Another type of optional sensor 75 that can be utilized by the fabric article treating device 20 of the present invention is a motion sensor. For fabric article drying appliances 35 which utilize a moving interior, such as a rotating drum, the motion sensor can detect if a fabric article drying appliance is in use. One example of a motion sensor is a vibration and movement sensing switch manufactured by ASSEM Tech Europe Ltd., of Clifton, N.J., available as Model No. CW1600-3. Another type of optional motion sensor that may be used in the present invention uses a light source to direct (infrared) light at a surface, and the relevant motion of that surface can be detected by the intensity and/or frequency of the returning light. Such sensors can measure the actual speed of rotation, if that information is desired. Another optional sensor 75 that can be used in a fabric article treating device 20 of the present invention is a humidity sensor. The optional humidity sensor, together with the controller, may be used to control the amount of composition being dispensed by the interior dispenser 25, and also may be utilized to determine the proper environmental conditions during an operational cycle in which the dispensing event should take place. Additionally, this humidity sensor may be used to maintain a specific humidity by controlling the dispensing the benefit composition such that optimal de-wrinkling and/or other benefits are achieved. Many different types of humidity sensors could be used in conjunction with the present invention, including variable conductivity sensors. One such sensor is manufactured by Honeywell, of Freeport, Ill. under the Model No. HIH-3610-001, although any of the HIH-3610 series, or other available sensors may be used. A further optional sensor 75 that can be useful in the fabric article treating device 20 of the present invention is a temperature sensor, such as one that outputs an analog or digital signal along the electrical conductor that leads back to the controller. As noted above, the fabric article treating device 20 may comprise a controller 60. In one embodiment, the controller may be a microcontroller. A suitable microcontroller is manufactured by MicroChip, of Chandler, Ariz. under the Part No. PIC16LS876-04/P. However, other microcontrollers made by different manufacturers could also easily be used. In one exemplary embodiment, the microcontroller includes on-board random access memory (RAM), on-board read only memory (ROM), which comprises electrically programmable non-volatile memory elements, as well as on-board input and output lines for analog and digital signals. The controller may also be used with a crystal clock oscillator, although a RC circuit could be used instead as a clock circuit, if desired. The clock circuit provides the timing of the clock as necessary to operate the controller. In one embodiment, the controller comprises a port that can be interfaced to an optional programmable interface using a communication link, such as RS-232 communication link. The port allows a user to alter the program information of the controller, such as dispensing options, etc. One skilled in the art will appreciate that the controller can be any type of microprocessor or microcontroller circuit commercially available, either with or without on-board RAM, RAM, or digital and analog input/output (I/O). Moreover, a sequential processor may be used to control the fabric article treating device 20, or alternatively a parallel processor architecture or a logic state machine architecture could be used. Furthermore, the controller 60 may be integrated into an Application Specific Integrated Circuit (ASIC) containing many other logic elements that could be used for various functions, as desired, such functions being optional depending upon the model of the fabric article treating device 20 that will be sold to a consumer. To change model features, the manufacturer need only program the ASIC or the on-board RAM of the controller according to the special parameters of that particular model, while using the same hardware for each of the units. It will also be understood that discrete digital logic could be used instead of any type of microprocessor microcontroller unit, or analog control circuitry could be used along with voltage comparators and analog timers, to control the timing events and to make decisions based on input levels of the various sensors that are provided with the fabric article treating device 20. Exemplary fabric article treating devices and systems include those described in co-pending U.S. application Ser. No. 10/697,735 filed on Oct. 29, 2003; U.S. application Ser. No. 10/697,685 filed on Oct. 29, 2003; U.S. application Ser. No. 10/697,734 filed on Oct. 29, 2003; U.S. application Ser. No. 10/697,736 filed on Oct. 29, 2003; and U.S. application Ser. No. 10/762,152 filed on 10/762,152. All documents cited in the detailed description of the invention are, in relevant part, incorporated herein by reference; a citation of any document is not to be construed as an admission that it is prior art with respect to the present invention. applying a benefit composition as a spray to the fabric article in the fabric article drying appliance, wherein the benefit composition comprises an agent for enhancing the whiteness and/or brightness of the fabric article. 2. The method of claim 1, wherein the whiteness and/or brightness enhancement agent comprises a brightener or dye, or a mixture thereof. 3. The method of claim 1, wherein the benefit composition provides a Whiteness Index measurement increase of 1.0 when a solution of >0.0001 ppm active is sprayed on white cotton fabric according to ASTM E 313. 4. The method of claim 1, wherein from about 0.1 ml to about 2,000 ml of the benefit composition is applied to the fabric article in the fabric article drying appliance. 5. The method of claim 4, wherein from about 1 ml to about 1,000 ml of the benefit composition is applied to the fabric article in the fabric article drying appliance. 6. The method of claim 5, wherein from about 10 ml to about 200 ml of the benefit composition is applied to the fabric article in the fabric article drying appliance. 7. The method of claim 1, wherein the spray has a liquid droplet size of from about 10 μm to about 100 mm. 8. The method of claim 7, wherein the spray has a liquid droplet size of from about 100 μm to about 1 mm. 9. The method of claim 8, wherein the spray has a liquid droplet size of from about 200 μm to about 700 μm. 10. The method of claim 1, wherein the article is dried without the addition of heat. 11. The method of claim 1, wherein the article is dried with air heated to a temperature of from about 50° F. to about 300° F.
12. The method of claim 1, wherein the benefit composition comprises a liquid or gel. 13. The method of claim 12, wherein the whiteness and/or brightness enhancement agent is in a microencapsulated form. 14. The method of claim 2, wherein the dye is selected from the group consisting of: basic dye, direct dye, acid dye, azoic dye, vat dye, reactive dye, disperse dye, polymer dye classes of the Color Index and combinations thereof. 15. The method of claim 2, wherein the whiteness and/or brightness enhancement agent comprises a dye having a maximum reflecting wavelength of from about 350 nm to about 550 nm. 16. The method of claim 15, wherein the whiteness and/or brightness enhancement agent comprises a dye having a maximum reflecting wavelength of from about 420 nm to about 500 nm. 17. The method of claim 16, wherein the whiteness and/or brightness enhancement agent comprises a dye having a maximum reflecting wavelength of from about 430 nm to about 480 nm. 18. The method of claim 1, wherein the enhancement agent comprises one or more conjugated bonds to enhance fabric substantivity. 19. The method of claim 1, wherein the benefit composition comprises from about 1×10−8 weight percent to about 0.5 weight percent enhancement agent. 20. The method of claim 1, wherein the benefit composition further comprises one or more components selected from the group consisting of: silicones, lubricants, wetting agents, polyanilines, polypyrroles, polyacetylene, polyphenylene, polythiophenes, fabric softeners, wrinkle mitigating agents, water absorbing agents, humectants, perfumes, anti-abrasion agents, reflectance agents, bleaches, superwetting agents, preservatives, buffering agents, pH adjusting agents, emulsion stabilizing agents, malodor control agents, oil dispersing solvents, anti-foaming agents, salts, viscosity adjusting agents, chelating agents, anti-oxidant, radical scavenging agents, soil releasing agents, anti-soiling agents, and anti-microbial agents.